I was looking at Las Vegas maps the other day and came across the new MGM-AEG Arena construction and The Park development. You can see where arena is located behind New York New York. The space between NYNY and Monte Carlo will be a pedestrian walkway back to the arena. 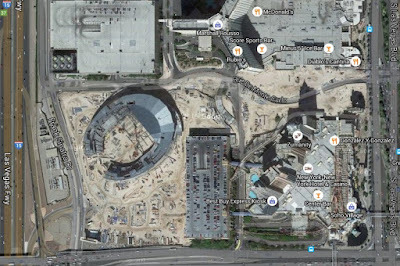 There is also curve in the road where you can tell where the new Monte Carlo theater will be located. 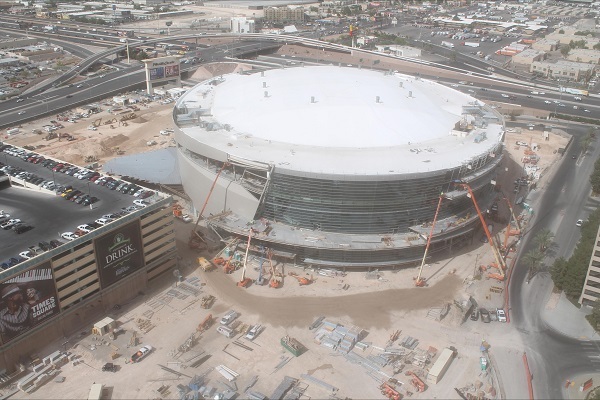 The official MGM arena website also has some construction webcams up. 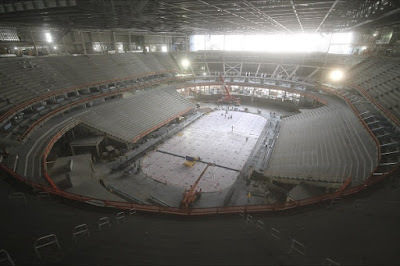 The exterior camera and time-lapse video shows the progress of the arena so far. You can see how much work has been done in the 15 or so months that construction has been going on. The interior camera gives a glimpse inside the arena. It looks like they might already be installing a hockey rink, which supports rumors of a hockey team moving or expanding to Vegas. You can see how much natural light is used, which I believe is pretty unique. The interior also has a time-lapse video. Also, Vital Vegas posted this picture on Twitter of the interior of the arena from a different angle. 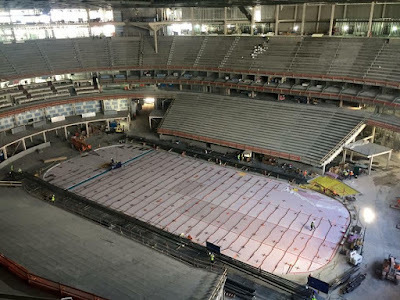 It looks like the upper deck sections will have their entrances at the top of the section, instead of having tunnels at the bottom of each section. Photo: John Kompare via Vital Vegas on Twitter.